Congratulations to all referees who received awards at the Annual Presentation Dinner held at the National Press Club - Barton in 2015. 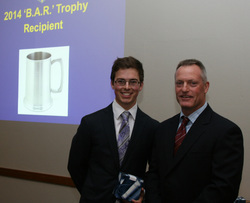 A special congratulations to Matt Hogan as the winner of the B.A.R. Trophy for 2015. Well done Matt! AUSTRALIAN FORESTRY SCHOOL TROPHY (Premier Division 3rd Grade Grand Final) – "In storage"